Louisiana – A Louisiana teenager flew for 10½ hours through a sandstorm over Saudi Arabia, got stuck in the Philippines by typhoons, and set three youth aviation records. He’d planned to spend two nights in the Philippines, but three typhoons — two of them Category 5 — kept him at Subic Bay from Sept. 2-21. “Jebi and Mangkhut were the biggest typhoons in ages,” he said. Between Subic Bay and Naha, Okinawa, his radio went out and, trying to avoid bad weather, he strayed into Taiwan’s airspace. “I was intercepted by a Taiwan F-16,” Andrews said. The aviation records aren’t official yet, but Andrews doesn’t expect any problems being certified as the youngest pilot to fly solo around the world and over the Atlantic and the Pacific oceans. “I know I did it. I’ll send them the information and get to work,” he said. Andrews’ father, Jeb Andrews, said his son first pitched the trip as a solo Atlantic crossing. “He came to us about three times. I said ‘No’ every time,” Jeb Andrews recounted. Finally, impressed with the information Mason had put together, he and his wife said yes. Andrews, who is majoring in professional aviation at Louisiana Tech, faces catch-up work in some tough college courses, since the trip took 76 days rather than the 40 he’d planned on. 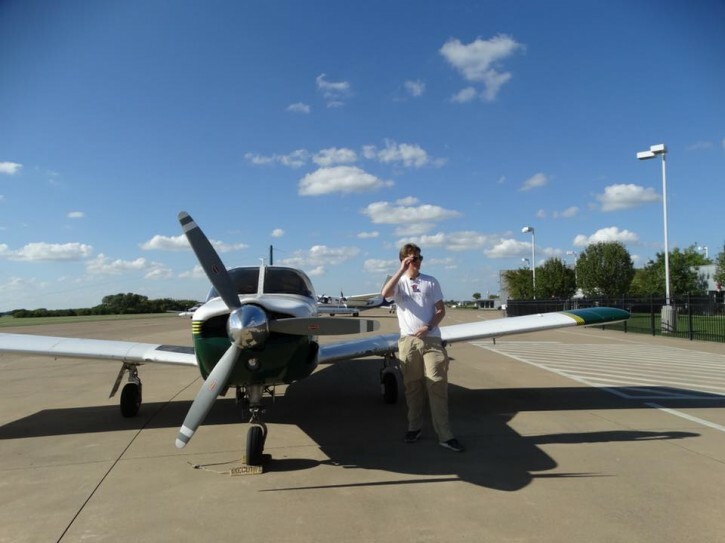 The trip’s 180 hours brings him about halfway to the 1,000 he needs for an airline transport pilot rating, but won’t count toward his commercial or flight instructor’s licenses, he said. University President Les Guice greeted him at the airport Saturday with a $10,000 scholarship from the Louisiana Tech Foundation. That will be a huge help both with expenses from the trip and school expenses, Andrews said. Louisiana’s TOPS scholarship covers tuition, but not such expenses as flight fuel and time. He said about 20 of the children he’s worked with there were among about a thousand people who were at the Monroe airport to greet him Saturday. “I will be attempting another aviation world record. No details yet. But there are more plans in the future,” he said.